Could this £1.26m Aston Martin be James Bond’s next boat? 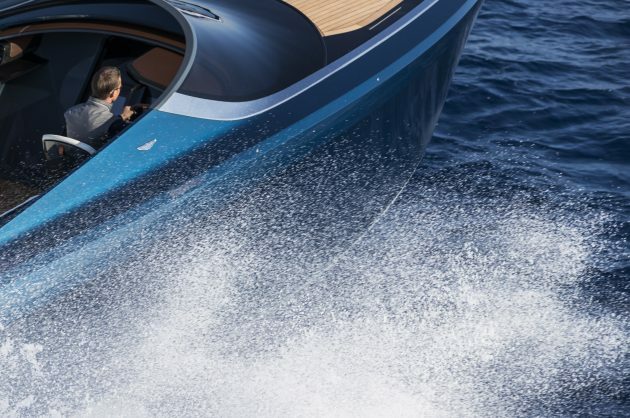 These are the first photographs of Aston Martin’s hotly anticipated AM37 sportsboat which is already being tipped as the natural choice for James Bond’s next boat. Q will have to find £1,260,720 for the AM37 with two 430 HP engines or £1,621,489 if 007 demands the Am37S Platinum Spec. 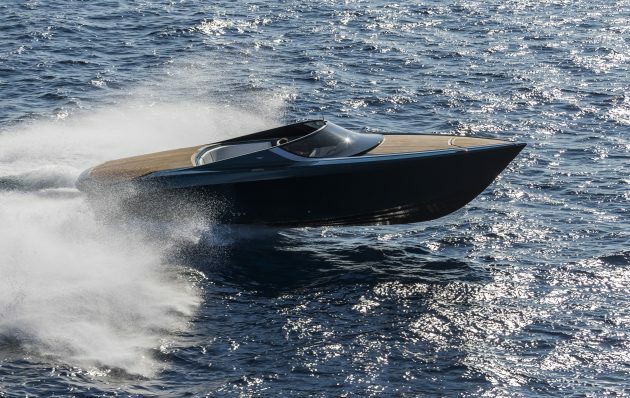 The 37ft luxury weekender was officially unveiled at the Monaco Yacht Show yesterday, marking the British sportscar manufacturer’s first foray into the nautical world. Developed by Aston Martin and Quintessence Yachts, it has a claimed top speed of 50 knots and several innovative new features including a retractable cockpit cover and bathing platform.At the touch of a button on the AM37’s key, three lightweight carbon fibre panels slide away under the aft deck to reveal the luxurious cockpit. Another button extends a bathing platform from under the transom while yet another raises the hydraulic carbon fibre bimini top from its stowed position under the engine hatch. Although designed primarily as a boat, the open plan cuddy cabin can be transformed into an overnight berth with the aid of a convertible dinette table. Mood lighting, air-conditioning, basic galley facilities and a toilet provide all the essentials for a romantic weekend.The cockpit seats up to eight people and is protected by a wraparound windscreen created from a single piece of extreme double curvature glass.At the helm, the AM37’s carbon fibre dashboard echoes styling elements from Aston Martin’s sports cars using top quality leather and polished metals for the steering wheel, throttles and joystick. The boat’s navigation, control monitor and entertainment systems are all integrated with advanced multimedia functions. The 37-foot model is available in two versions: the AM37 with an estimated top speed of 45 knots and a choice of two 370hp Mercury diesel or two 430hp Mercury petrol engines; and the AM37S with an estimated 50 knots derived from its twin 520hp Mercury petrol engines.